Wednesday was a fun day. I caught a ride to the yard with Jess and Ella Green on their way to a combined test with their own horse, Sky. 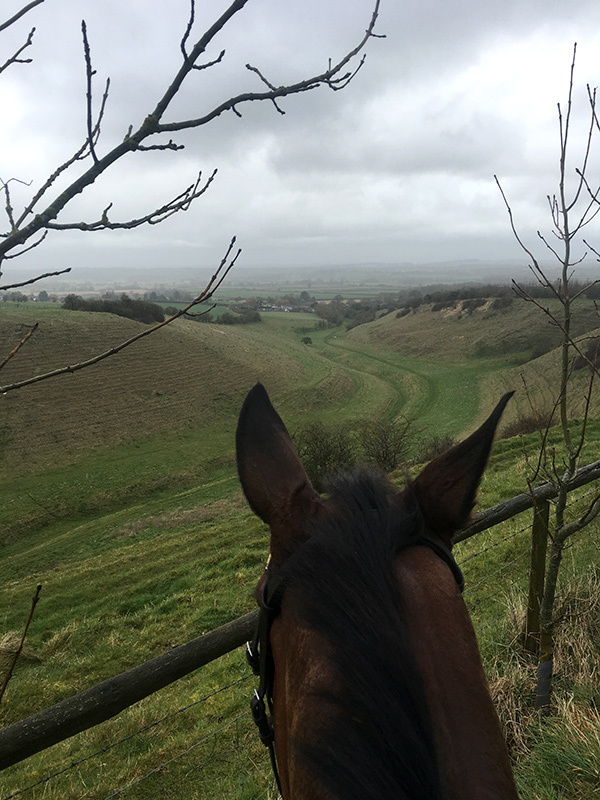 I took Woody for a hack on the all-weather gallop. I was waiting for a break in the weather till I asked one of the students and they said don’t bother, it won’t come. Of course it rained harder as soon as I put my foot in the stirrup. Woody used the wind and his quarter sheet as a good game for most of our first trot work. It was still an amazing experience due to the fact that at one point MARK TODD went galloping past me! After that they asked me if I would ride a horse for them on the flat. She is a lovely big show jumping mare who responded really well to suppling work and improved nicely. I had some fun at the end of my ride doing some flying changes. Thursday was a humdinger! I tried to get to the barn on my own in a Volkswagen Polo that the Green family kindly loaned me for my stay. In true O’Hanlon directionally challenged style I got royally lost of course. So guess who I got to warm up… Rhapsody! He was absolutely lovely. Not only that, but I watched Mark ride Leonidas on the flat. Rhapsody is Belgium crossed with an Irish mare, he has the best of both worlds. Fantastic power house movement and a lovely kind Irish attitude, his trot is to die for. Then I got to cool out Leonidas while Mark schooled Rhapsody. Absolutely incredible! I’m still on cloud nine. I learned so much just by watching. I rode Woody afterwards so that he could have a nice acupuncture treatment from Dr Christiana Ober around 11:00 a.m. It was so nice to have Dr Ober back working with us. I did a flat school using the fabulous mirrors at the end of the ring. Mostly I worked in walk and canter with lateral work, square halts and rein back. Tomorrow we will do a slightly more intense dressage school and then start galloping this weekend. To top off a fantastic day I watched Mark cross country school his youngster by (Chilly Morning). He is a lovely big six-year-old gelding called Fonzie. He reminds me of Benny and even clowns around a little like Benny. So I know there’s hope because he’s a fabulous jumper and a joy to watch. I can’t wait for tomorrow’s adventure.